Zynga has partnered with GameStop to bring an offer to players purchasing game cards in GameStop retail stores. When players purchase a game card at a GameStop store between 9/27/10-10/31/10 then redeem online, they will be able to choose a free gift from one of many Zynga games. Game cards are available for Cafe World, Mafia Wars, FarmVille, YoVille, FrontierVille, and more. GameStop sells the game cards in both $10 and $25 dollar denominations. Continue reading to find out how you can earn a free gift. 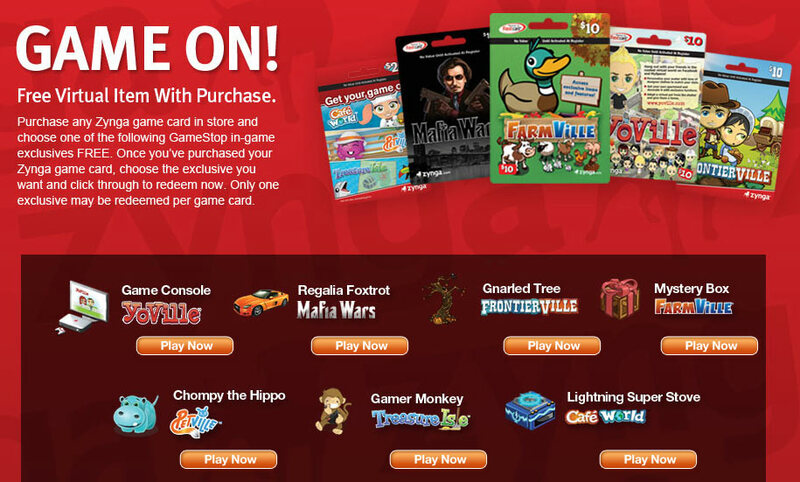 "Purchase any Zynga game card in store and choose one of the following GameStop in-game exclusives FREE. Once you've purcahsed your Zynga game card, choose the exclusive you want and click through to redeem now. Only once exclusive may be redeemed per game card." Those are some very nice free prizes. My favorites have to be the Lightning Super Stove that reduces cooking time by fifty percent and the FrontierVille gnarled tree catch. Will you purchase a GameStop FarmVille game card? If so, share with others what you will choose!